How To Be Changed By God From The Inside Out! 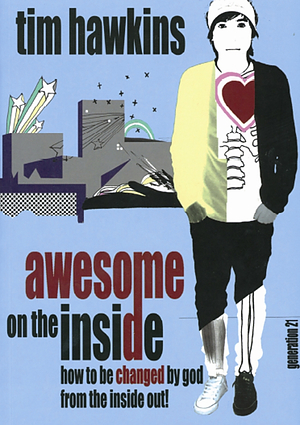 This eye-opening book is a practical and relevant work on image and self-esteem for 21st century teenagers. Identifying with the difficulites young people face and tackling them in a clear and straightforward way, this new book from bestselling author Tim Hawkins explores the big changes God wants in the lives of young people of all nations. Awesome On The Inside by Tim Hawkins was published by Good Book Company in January 2007 and is our 10336th best seller. The ISBN for Awesome On The Inside is 9780958184311. Young people like to be challenged and inspired and I found this book able to do both. The first few chapters are written using phrases that the writer feels will attract the target group, but I found these first pages irritating and repetitive. If you can get past this section and delve deeper to read about how God calls us to have ‘Hearts that are passionate, pure and positive’, then you will be inspired. The author begins by challenging young people to think about their image on the outside and then introduces the thought that the Inside is more important than the Outside. By using well known Bible references he continues the theme of the book by explaining how our hearts can be changed as we turn to Christ. He takes our eyes off ourselves and turns them to the Scriptures and thus to our Creator. The chapters are short and the book is easy to read for those young people who are perhaps on the fringe but has depth also for those who are more committed – a great resource to use for study material too in small groups. I hope to use it soon. Got a question? No problem! Just click here to ask us about Awesome On The Inside.